Ever since I spent a few months in Glasgow in 2000 and fell in love with the Glasgow Film Theatre, I’ve been hoping that a good repertory cinema would open a bit closer to home. Last autumn, that wish came true, when a local cinema that before had mostly shown B movies along the lines of The Core and The Extraordinary League of Gentlemen was refurnished and turned into a cinematic time capsule. They show some current arthouse fare at the Kino Rex Bern, but mostly they show classics, whether American, European or otherwise, and organise series on particular themes or filmmakers. Interstellar pushed many of the right buttons for me, primarily the big one labelled “Sense of cosmic wonder”. I was the kid who had a poster of the solar system on his bedroom wall for an embarrassingly long time; I loved anything to do with space, but I reserved a special love for space exploration, especially of the supposedly authentic kind. Sure, I wanted to fly an X-Wing, but that thought never felt as wondrous as that of NASA journeys, of the Apollo missions or the Space Shuttle. Wormholes and black holes? Accretion disks? Count me in. That sense of wonder was definitely there when I watched Interstellar, and the film captures it well. What it captures less well, though, is human emotion – which is a problem, since for all its space age imagery the film is essentially about sentiment much more than it is about physics. It’s not the emotions themselves that are the problem; thematically, Interstellar uses its premise and setting to tell a very human story. The problem is that the Nolans are much better at telling a different kind of story – one that is conceptual, that tends to be about puzzles. At their best, the Nolan-directed and -penned films are interested in the feelings of their characters, but they don’t focus on them head on. Their protagonists are often emotionally repressed, in denial or simply unable to access or express their feelings, and the stories tend to derive poignancy from this inability. 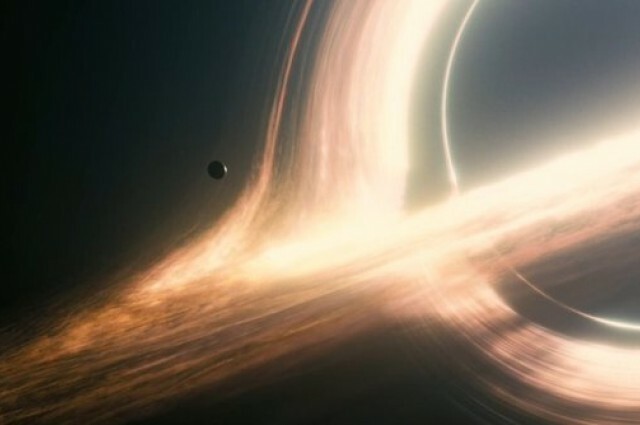 Interstellar, though, wears its heart on its sleeve. Its characters talk about their emotions, they cry quickly and freely – and while the actors are more than capable, they can’t overcome that the words they’ve been given are often clumsy, overly explicit, explaining things too much. The worst scene in this respect has a teary-eyed Anne Hathaway trying to impress on her fellow astronauts that love is a force transcending space and time. Done differently, written better and allowing for some ambiguity, this could work, but in the film it feels like a NASA-themed Hallmark card. Those moments very much suggest that when it comes to the Nolans’ dialogue, quite literally, the less said, the better. When I first saw the Interstellar trailer, I was intrigued, but I was equally worried that this would be Nolan’s Contact, an intriguing sci-fi tale that takes a turn for the sentimental: daddy issues in space. It isn’t quite that bad, and there’s a lot to like about the film. It is ambitious, it is often beautiful, and Matthew McConaughey has vastly improved as an actor since the giddy days of 1997. Interstellar is a compelling illustration of both the strengths and the limitations of Nolan’s filmmaking, though, and it is frustrating in how it could have been a better, more subtle and more convincing film. This isn’t a complaint along the lines of “Waiter, there’s some sentiment in my sci-fi soup!” I don’t think that hard sci-fi, or any sci-fi, needs to lose the human element. What it does need, though, is a human element that’s done with the same skill as the visual effects. Interstellar excels at showing us the surfaces of alien worlds, but its telescope is flawed when pointed at the human heart. When is a still not a still? Jim Emerson recently posted about cinematoGIFs, animated stills (that’ll do in your brain!) that try to capture the essence of a scene. The results are evocative and almost hypnotic… I challenge anyone to make such a not-quite-still out of a Michael Bay movie, though! Edit: Not sure whether these actually work embedded in a WordPress post. When you click on them – or follow the original link above – you should be able to see them in their full, animated glory, though! Make sure to check out the rest of them! There’s something weird going on in P.T. Anderson’s There Will Be Blood. Okay, there are many weird things going on – the film is quite confounding on the whole, as it doesn’t present its story the way you’d expect it – but when you watch the beginning of the film, a long sequence without any dialogue, you feel some strange sort of double vision. At least you do if you’re a film nerd like me, that is. There is some sort of weird intertextual thing going on between There Will Be Blood and Kubrick’s movies that is discussed intelligently in this forum post. Beyond that, though, there something eerily ritualistic and religious about the film’s beginning: it’s as if the black liquid gushing from the ground is the harbinger of some new, cruel religion that will require sacrifices. In his way, Daniel Plainview (a disturbing performance by Daniel Day Lewis that is more complex than its detractors admit) is more of a mad prophet than his opponent, the self-righteous yet wheedling Eli Sunday. It’s just that human beings have no place in his religion. I recently re-watched Magnolia, which I still like a lot, so There Will Be Blood came as a surprise. Even Punch Drunk Love, which I didn’t particularly enjoy (or understand), felt more like the P.T. Anderson who made Magnolia and Boogie Nights. Those latter two films were quintessential ensemble movies. There Will Be Blood has barely enough space for one or two characters next to Plainview. It grows out of its central monolithic (if you forgive the Kubrickian pun) protagonist: perhaps the most frightening character in recent film history. P.S. : Please keep in mind that I haven’t yet seen No Country for Old Men, so I can’t judge the scariness of that film’s Anton Chigurh. His hair’s plenty scary enough, though. P.P.S. : After Miami Vice used to be the top search term leading people to this website, it has now become “magenta”. So, my heartfelt thanks to one of my frequent readers. Hope you’re getting just as many hits because of me!